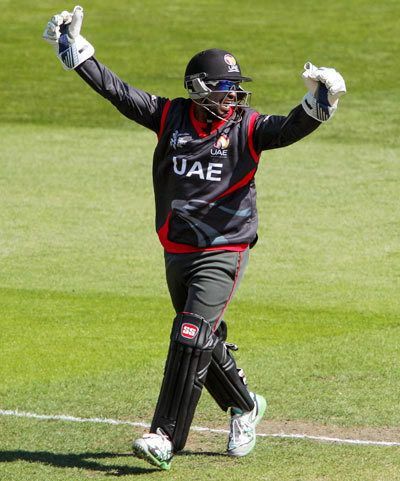 Swapnil Patil (Marathi: स्वप्नील पाटील; born 15 April 1985) is an Indian-born Emirati cricketer. Patil is a right-handed wicket-keeper batsman. He played for the United Arab Emirates in the 2014 Cricket World Cup Qualifier tournament where he made ODI debut in final in New Zealand against Scotland at Bert Sutcliffe Oval in Lincoln. Patil was among six players making their One Day International (ODI) debuts and he impressed with a run-a-ball 99. He was dropped off the penultimate ball and needed two off the final delivery of the chase to reach a memorable century but could only edge to midwicket for a single. Patil became the second player to score 99 on ODI debut after Eoin Morgan. Patil also set the record for becoming the first cricketer to be unbeaten on 99 on ODI debut. In March 2014, he made his T20I debut against Netherlands in Sylhet Stadium in ICC World Twenty20 in Bangladesh. He scored 23 runs off 28 balls before being dismissed by Tom Cooper.